John Wesley’s Teachings is the first systematic exposition of John Wesley's theology that is also faithful to Wesley's own writings. Wesley was a prolific writer and commentator on Scripture---his collected works fill eighteen volumes---and yet it is commonly held that he was not systematic or consistent in his theology and teachings. On the contrary, Thomas C. Oden demonstrates that Wesley displayed a remarkable degree of internal consistency over sixty years of preaching and ministry. 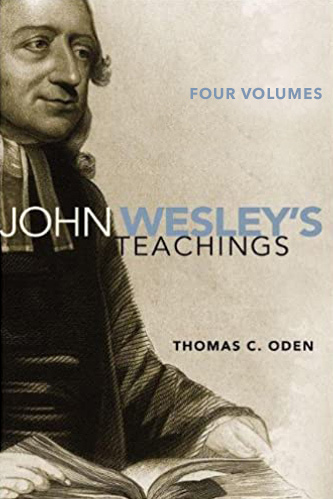 This series of 4 volumes is a text-by-text guide to John Wesley’s teaching. It introduces Wesley’s thought on the basic tenets of Christian teaching: God, providence, and man (volume 1), Christ and salvation (volume 2), the practice of pastoral care (volume 3), and issues of ethics and society (volume 4). In everyday modern English, Oden clarifies Wesley’s explicit intent and communicates his meaning clearly to a contemporary audience. Both lay and professional readers will find this series useful for devotional reading, moral reflection, sermon preparation, and for referencing Wesley’s opinions on a broad range of pressing issues of contemporary society.